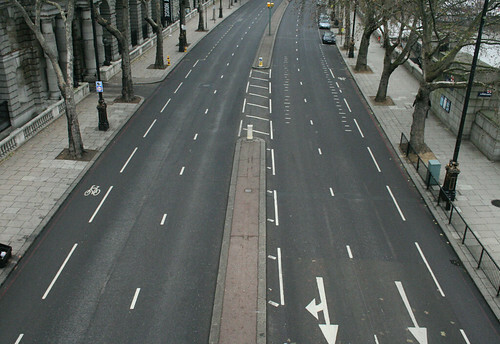 Two years ago I cycled around London on Christmas morning taking photos of a city that was, thanks to the lack of public transport and everything being closed – was itself totally deserted of people. I was somewhat surprised at how popular the photos were, as they were taken as a long-planned, but mere idle curiosity. Quite a pleasant surprise. Those original photos can be found here. Last time I failed to get the key photo I had wanted, of an empty Westminster Bridge – the inspiration from 28 Days Later – so I just had to get back and do it all over again! This year there seemed to be rather more people around than last time – and rather a lot of photographers (glare!). The Boris Bikes were also filling the transport gap left by the tube and bus closures, so I didn’t quite get *that scene* as I had wanted, but it was still fun to cycle around an almost deserted city again. Naturally, you can’t be in the area without getting photos of Whitehall. It seems that the warning road sign actually makes the desolation of the road seem even more sudden and apocalyptic. Another classic location from 28 Days Later – just minus a guy in hospital gown, and as I realised when I got home, I pointed the wrong direction. Oh well – gives me an excuse to try again next year! Just around the corner is the usually very busy St James Street leading up towards Picadilly. 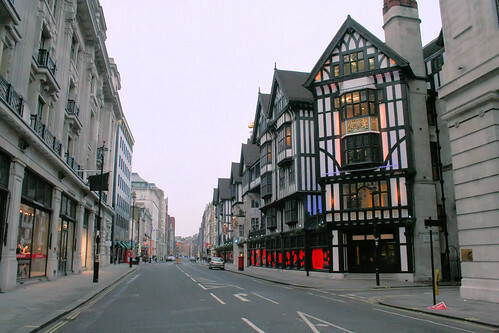 Up to Regents Street, and here is iconic London department store, Liberty. 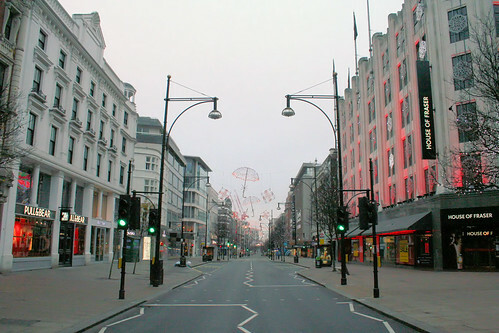 Oxford Street was deserted as expected. As last time, it wasn’t so much the desolation that makes the experience of cycling around so memorable, but the eerie silence in a city that is usually so noisy. 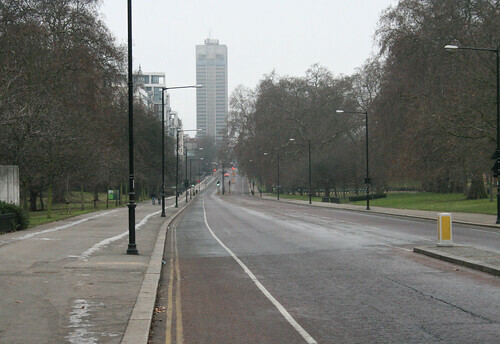 The roads around Hyde Park, normally a main corridor in to London were equally empty. 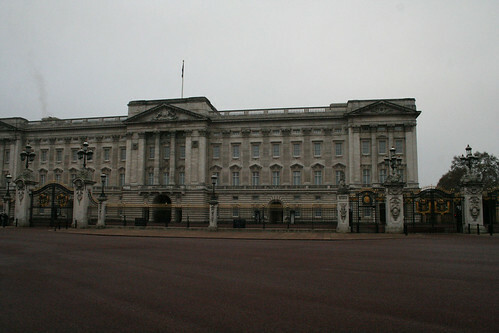 By the time I got to Buckingham Palace though, there were by now some tourists around the place trying to find something to do on the quietest day of the year. 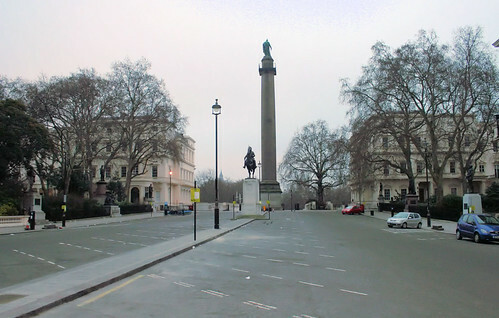 Wandering around – past the usually packed Embankment and heading over to Covent Garden. By now, the streets were starting to fill up again, so it was a diversion over to the Charles Dickens Museum which was having a special Christmas opening, and then to home. In total, about 8 hours of walking into London, cycling around on a Boris Bike, and walking home again. More photos from 2010 can be found here. The original photos from 2008 can be found here. It is quite an addictive sensation – seeing the city in such a strange light and atmosphere and despite the hassles of getting up early and getting into town, it is entirely worth the effort. I had a few Twitter messages as I went around, including several from people asking if coffee shops were open as they didn’t want to come into the centre if they weren’t. Umm, no they weren’t – that was the point of a desolate city. It is claimed that the cockroach will be the only creature to survive a Nuclear holocaust. 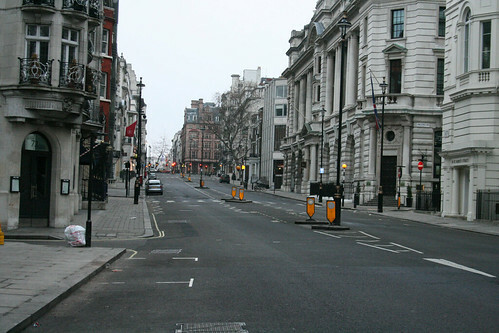 If London is lain waste, people expect Starbucks to still be open. You can make your own inference from that! If you liked that – keep updated with the newest blog posts via my Facebook Page. These photos are just amazing! I couldn’t stop shouting, “Oh my gosh!” as I scrolled down to each new picture. I am amazed that the VW van is still there outside Covent Garden tube station even on Christmas Day! I have never been past there yet and it not be there! Does it have planning permission as a permanant structure 🙂 I am also amazed it is not covered in parking tickets! Another way to show deserted scenes is to use a pinhole camera that admits so little light that exposures of minutes are required. Thus, moving vehicles don’t appear, and pedestrians appear as little more than a slight blur if at all. Similar images can be had if a sufficiently dense neutral-density filter can be devised to cover the lens on a standard camera. My experience is with film, so I don’t know whether digital cameras can accommodate making long exposures like these. It is one thing to get the photos with “trickery”, but so much better to capture a real moment in time. I appreciate and certainly don’t mean to belittle your effort in getting out and about on Xmas morning in order to photograph the West End deserted. I was merely noting that the same sorts of views can be captured almost any time by using really long exposures. So you should feel no need to defend your enterprise, and you certainly needn’t accuse pinhole photography of “trickery” and then assert that capturing a “real moment in time” (which I assume means using exposures of less than a second) is “better” than taking advantage of the innate integrative ability of film, as the pinhole camera does. A short exposure isn’t “better” than a five-minute exposure, unless you’re trying to stop motion or have no way to lock down your camera. I think he meant actually being in the deserted city is part of the value. 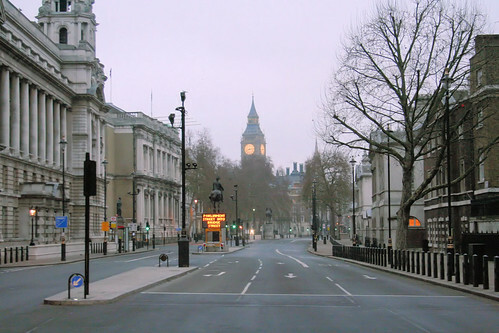 I love the pictures of a truly deserted London! 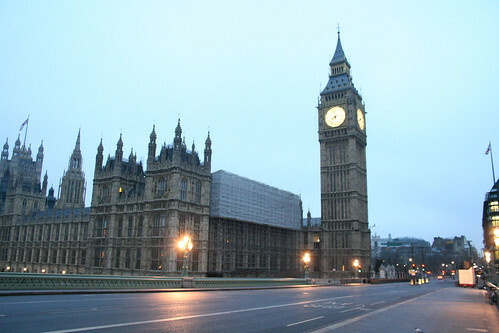 I hope to be in London some year for Christmas so I can see it for myself. Thanks for posting the pictures. 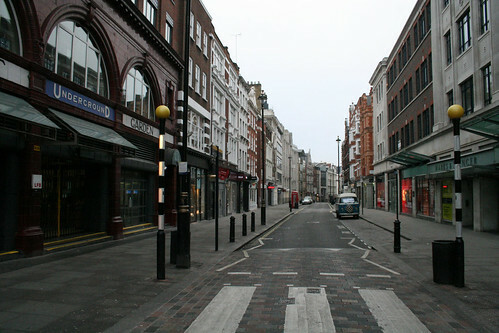 2 Pings/Trackbacks for "Even More Photos of a Deserted London"